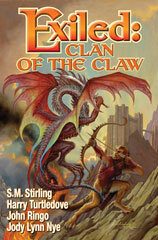 Exiled: Clan of the Claw is ostensibly alternate-universe science fiction, not fantasy. Editor Bill Fawcett postulates that the Giant Meteor that struck the Earth 65.5 million years ago, causing the extinction of the dinosaurs (according to one theory), never occurred. The dinosaurs continue to live, evolving into an intelligent humanoid reptile “man” – the Liskash. Mammals evolve, too, resulting in an intelligent humanoid feline “man” – the Mrem. The two are instinctual deadly adversaries; both use “mind magic” against each other, but this is arguably a psionic talent, not a supernatural power. When the Atlantic Ocean breaks into and fills the dry Mediterranean basin 5.3 million years ago, it cuts off the Mrem to the north from the Liskash to the south – except for one Mrem clan stranded in our world’s North Africa. Vastly outnumbered by its vicious Liskash neighbors, the isolated Clan of the Claw begins a desperate trek around the New Water to reunite with its Mrem brethen, in four novellas by different authors in this “Book One of a new series”. This is actually Bill Fawcett’s third go-around with the Mrem and the Liskash (although the Liskash are spelled Lizcanth in the second series). In 1989-1990 he packaged four paperback novels, “Guardians of the Three”, for Bantam Spectra; in 1999 it was three “Shattered Light” novels for Pocket Books (1, 2, 3). A smerp hopped by. When the breeze shifted and brought it the scent of the two Mrem, it squeaked in fright and dove under a thornbush. Rantan Taggah felt a great tug of memory. When he was a kit, how many smerps had he chased while he was learning to hunt? How many of them had got away under thornbushes or between rocks or down holes in the ground? How proud had he been when he finally caught one? And how horrified had he been a moment later, when it bit his hand, jumped free, and fled? For all the authors’ frequent mentions of the Mrems’ furry bodies, twitching pointed ears, and lashing tails (“Her fur was rumpled, ungroomed. She yawned enormously, showing off her fangs.” -- p. 64), and the Liskashs’ reptilian scaliness, it all never seems like much more than two human armies dashing toward each other in their war-chariots, like the Macedonians and Persians in 333 BC. Exiled leads off with “The Mrem Go West” by Harry Turtledove, in which the Clan of the Claw decides upon its trek and fights the nearest Liskash lord/sorceror. This introduces the tribal male Mrem warriors and the female priesthood of Dancers who combat the stronger Liskash mind magic; and the arrogant Liskash self-proclaimed gods. Turtledove’s story is another example of The Author Having Fun. The only imagination in this bland tale of warfare between two Bronze Age cultures lies in the characters’ personal names. The heroic Mrem clan-leader is Rantan Taggah, which sounds suspiciously close to T. S. Eliot’s Rum Tum Tugger, in Eliot’s Old Possum’s Book of Practical Cats and the musical Cats. The cruel Liskash lord/sorceror is Sassin – he assassinates his enemies. Ha, ha. S. M. Stirling’s “A Little Power” is colorfully set in a Liskash kingdom whose queen calls herself a goddess, and the princess is a “young goddess”. This has a better description of the lizard people. “[Hisshah’s] mother wore no jewelry at all; instead her whole body glittered with tiny embedded gems, one to a scale, a privilege she reserved for herself alone.” (p. 82) Goddess Ashala and her daughter, young goddess Hisshah, hate and conspire against each other and other scheming nobles. Mrem slave Ranowr plays them all off against each other to enable this Liskash land’s captive Mrem to escape to the Clan of the Claw as it migrates by. In “Battle’s Tide”, by Michael Z. Williamson, the New Sea is still rising. A new Mrem clan, the Clan of Three Fangs, takes the stage. These Mrem face an even more powerful Liskash lord, Oglut, and his sons Buloth and Mutal. To defeat their mind-controlled armies, Clan Leader Nrao Aveldt sets his two independent leaders, military Talonmaster Hress Rscil and head priestess Dancer Cmeo Mrist, to develop a new joint strategy so that the Mrem will fight better together. More war chariot armies charging recklessly at each other. “Cata”, by Jody Lynn Nye & John Ringo, is considerably more refined than the other stories. Rantan Taggah assigns the small Lailah tribe of the Clan of the Claw to negotiate a peaceful safe passage with “Tae Shanissi, lord and self-proclaimed deity of the sovereign city-state of Ckotliss” (p. 226), past that Liskash metropolis. Lord Tae agrees, provided the Lailah will send him someone to teach him about Mrem culture. So a delegation consisting of counselor Sherril Rangawo, Dancer Cleotra Mreem and her apprectice Ysella Ehe, and a few others venture to Lord Tae’s court in the center of Ckotliss. It turns out to be a trap, of course, and the Mrem diplomatic party must fight its way out of the Liskash treachery. Nye & Ringo consistently refer to the Liskash as blue-skinned dinos, which is a nice touch of originality. The book ends abruptly here. But we are told that this is only Book One of “Exiled: Clan of the Claw”. How many volumes do you think they can stretch this out to? And does the reader really care? This third go-around with the cat-people and the lizard-people still seems very dull. All of the authors have done better.